MK Dons booked a place in the Southern Section final of the Johnstone's Paint Trophy by thrashing Hereford. Sam Baldock fired past Adam Bartlett to put them ahead, before Leon Constantine missed a sitter for the hosts. Constantine did equalise by converting Jon Godsmark's cross, but Jason Puncheon capitalised on a defensive error soon after to make it 2-1. Aaron Wilbraham drilled in to make the game safe and Jermaine Easter fired home a fourth to wrap things up. "First half we were fine without creating too much in the final third. "After half-time, we had a spell when we got at them, scored a cracking goal and we were on top at that stage. "But their second goal ended it for us. A bit of spirit went out of us. "I am disappointed in the manner we conceded some of the goals." "They made it difficult for us and managed to get the equaliser. But fair play to our boys, they responded ever so well and we ran out comfortable winners in the end. "It's never an easy place to come. They have had some good results here against higher opposition. We are delighted to get to the final." 90:00+4:19 The referee blows for the end of the match. 90:00+3:55 Lewis Gobern takes a shot. Save by Adam Bartlett. 90:00+3:34 Aaron Wilbraham takes a shot. Save by Adam Bartlett. 90:00+0:32 Inswinging corner taken by Matt Done from the right by-line, Aaron Wilbraham makes a clearance. 89:38 The official flags Leon Constantine offside. Willy Gueret takes the indirect free kick. 88:20 Free kick crossed right-footed by Jordon Mutch, Dan Woodards makes a clearance. 88:20 Booking Lewis Gobern is given a yellow card. 88:05 Lewis Gobern gives away a free kick for an unfair challenge on Matt Done. 86:48 The assistant referee signals for offside against Aaron Wilbraham. Adam Bartlett restarts play with the free kick. 84:32 Free kick awarded for a foul by Darren Jones on Lewis Gobern. Jason Puncheon has an effort direct from the free kick. 82:32 Jason Puncheon provided the assist for the goal. 82:32 GOAL - Jermaine Easter:Hereford 1 - 4 MK Dons A goal is scored by Jermaine Easter from inside the penalty area to the bottom left corner of the goal. Hereford 1-4 Milton Keynes Dons. 81:29 Mathieu Manset challenges Dean Lewington unfairly and gives away a free kick. Willy Gueret takes the free kick. 80:43 Jason Puncheon takes the inswinging corner, save by Adam Bartlett. 80:02 Substitution Peter Leven replaces Stephen Gleeson. 79:24 Nigel Quashie takes a shot. Save by Adam Bartlett. 77:37 Assist on the goal came from Lewis Gobern. 77:37 GOAL - Aaron Wilbraham:Hereford 1 - 3 MK Dons Aaron Wilbraham gets on the score sheet with a goal from inside the box to the bottom left corner of the goal. Hereford 1-3 Milton Keynes Dons. 77:01 Jermaine Easter fouled by Darren Jones, the ref awards a free kick. Free kick taken by Stephen Gleeson. 76:10 Substitution (Hereford) makes a substitution, with Matt Done coming on for Marc Pugh. 75:18 The ball is swung over by Jason Puncheon. 74:05 Mathias Doumbe concedes a free kick for a foul on Mathieu Manset. Direct free kick taken by Jordon Mutch. 73:07 Substitution Mathieu Manset joins the action as a substitute, replacing Craig King. 72:37 Jason Puncheon produces a cross, save by Adam Bartlett. 71:33 Free kick awarded for an unfair challenge on Jonny Godsmark by Dean Lewington. Free kick crossed right-footed by Jordon Mutch, Nigel Quashie makes a clearance. 70:08 The ball is swung over by Aaron Wilbraham, Jermaine Easter takes a shot. Blocked by Kenny Lunt. 68:39 GOAL - Jason Puncheon:Hereford 1 - 2 MK Dons Jason Puncheon gets on the score sheet with a goal from close in to the top right corner of the goal. Hereford 1-2 Milton Keynes Dons. 67:53 The assistant referee flags for offside against Leon Constantine. Willy Gueret takes the free kick. 66:16 Substitution Aaron Wilbraham is brought on as a substitute for Luke Chadwick. 64:59 Foul by Lewis Gobern on Jordon Mutch, free kick awarded. Adam Bartlett takes the direct free kick. 64:44 Corner taken by Jason Puncheon from the left by-line, clearance made by Jordon Mutch. 62:15 The assist for the goal came from Jonny Godsmark. Lewis Gobern concedes a free kick for a foul on Sam Gwynne. Jordon Mutch crosses the ball, Leon Constantine produces a right-footed shot from close in which goes wide of the left-hand upright. 62:15 GOAL - Leon Constantine:Hereford 1 - 1 MK Dons Leon Constantine scores a goal from inside the six-yard box high into the middle of the goal. Hereford 1-1 Milton Keynes Dons. 61:56 The ball is delivered by Marc Pugh, clearance by Dean Lewington. 61:41 The ball is crossed by Sam Gwynne, clearance made by Nigel Quashie. 61:10 Foul by Kenny Lunt on Lewis Gobern, free kick awarded. Free kick taken by Lewis Gobern. 59:33 Jermaine Easter has an effort at goal from close in which goes wide left of the target. 57:41 Substitution (Milton Keynes Dons) makes a substitution, with Lewis Gobern coming on for Sam Baldock. 56:18 Jordon Mutch restarts play with the free kick. 56:18 Booking Stephen Gleeson booked for unsporting behaviour. 56:16 Free kick awarded for an unfair challenge on Leon Constantine by David McCracken. 53:25 Substitution Jonny Godsmark comes on in place of Gavin McCallum. 51:47 Leon Constantine is caught offside. Indirect free kick taken by Willy Gueret. 51:31 The ball is sent over by Nigel Quashie, save made by Adam Bartlett. 49:47 Sam Gwynne sends in a cross, Dan Woodards manages to make a clearance. 45:00+1:32 The referee calls an end to the first half. 45:00+0:35 Inswinging corner taken by Gavin McCallum from the right by-line, Mathias Doumbe manages to make a clearance. 43:19 Inswinging corner taken left-footed by Jason Puncheon from the right by-line, clearance by Sam Gwynne. 43:10 The ball is swung over by Jason Puncheon, blocked by Tyler Weer. 42:48 Short corner worked by Jason Puncheon. 42:35 Sam Baldock takes a shot. Blocked by Keith Lowe. 41:07 A cross is delivered by Gavin McCallum, David McCracken makes a clearance. 40:27 Corner taken left-footed by Gavin McCallum, save by Willy Gueret. 40:04 Jordon Mutch takes a shot. David McCracken gets a block in. 38:37 Marc Pugh delivers the ball, save by Willy Gueret. 38:10 Kenny Lunt produces a cross, Mathias Doumbe manages to make a clearance. 37:49 Sam Baldock takes a shot. Blocked by Darren Jones. 36:56 Nigel Quashie concedes a free kick for a foul on Jordon Mutch. Direct free kick taken by Keith Lowe. 34:44 Jordon Mutch produces a right-footed shot from just outside the area that goes wide left of the goal. Correction - 34:10 The ball is delivered by Jason Puncheon, Mathias Doumbe produces a header from close range which goes wide of the left-hand post. 34:10 Jason Puncheon sends in a cross, Close range header by Jermaine Easter goes wide of the left-hand upright. 33:23 Outswinging corner taken left-footed by Jason Puncheon from the left by-line to the near post, Leon Constantine manages to make a clearance. 30:40 The ball is crossed by Gavin McCallum. 27:36 Dan Woodards fouled by Craig King, the ref awards a free kick. Direct free kick taken by Willy Gueret. 26:58 Jermaine Easter produces a right-footed shot from just outside the penalty box that goes wide left of the target. 21:23 Mathias Doumbe gives away a free kick for an unfair challenge on Leon Constantine. Free kick taken by Kenny Lunt. 20:19 Sam Baldock crosses the ball. 20:01 Sam Baldock takes a shot. Save made by Adam Bartlett. 17:22 Unfair challenge on Darren Jones by Jermaine Easter results in a free kick. Direct free kick taken by Darren Jones. 15:44 Foul by Jordon Mutch on Stephen Gleeson, free kick awarded. Willy Gueret restarts play with the free kick. 14:35 The ball is crossed by Jason Puncheon, Darren Jones makes a clearance. 13:10 The official flags Marc Pugh offside. Free kick taken by Willy Gueret. 12:43 Leon Constantine takes a shot. Save made by Willy Gueret. 12:17 The referee blows for offside. Jordon Mutch restarts play with the free kick. 11:34 Free kick awarded for a foul by Jordon Mutch on Stephen Gleeson. Direct free kick taken by Willy Gueret. 10:08 Jason Puncheon crosses the ball, Adam Bartlett makes a save. 9:37 Corner taken by Jason Puncheon from the right by-line to the near post, Tyler Weer makes a clearance. 9:23 Jermaine Easter takes a shot. Save by Adam Bartlett. 9:01 The referee penalises David McCracken for handball. Direct free kick taken by Jordon Mutch. 6:33 Free kick awarded for an unfair challenge on Kenny Lunt by Nigel Quashie. Free kick taken by Jordon Mutch. 5:09 The assist for the goal came from Jason Puncheon. 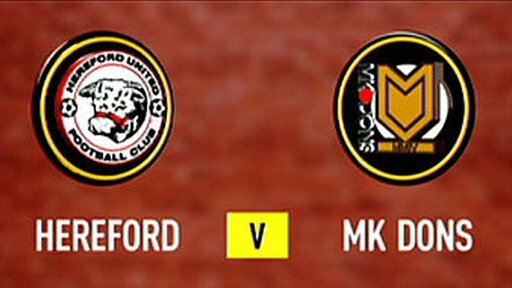 5:09 GOAL - Sam Baldock:Hereford 0 - 1 MK Dons Sam Baldock gets on the score sheet with a goal from close range to the bottom left corner of the goal. Hereford 0-1 Milton Keynes Dons. 3:01 The ball is crossed by Sam Baldock, save made by Adam Bartlett.